The Global Volcanism Program has no activity reports for Corbetti Caldera. The Global Volcanism Program has no Weekly Reports available for Corbetti Caldera. The Global Volcanism Program has no Bulletin Reports available for Corbetti Caldera. The 15-km-wide Corbetti caldera overlaps the NW margin of the older 30 x 40 km Awasa caldera. Urji volcano was subsequently constructed in its center, which also contains young lava flows. Chabbi volcano, a large obsidian dome that grew on the SE caldera rim, has erupted lava flows onto the caldera floor. The age of the latest eruptive activity is not known, although many lava flows are too young to date by the Potassium-Argon method. Fumarolic activity continues at the post-caldera cones of Urji, Chabbi, and an unnamed pyroclastic cone on the W rim. Decker R W, 1971. Table of Active Volcanoes of the World. Unpublished 41 page table, compiled primarily from IAVCEI catalogs with revisions by many volcanologists. Di Paola G M, 1971. Geology of the Corbetti Caldera (main Ethiopian rift valley). Bull Volcanol, 35: 497-506. Mohr P A, Mitchell J G, Raynolds R G H, 1980. Quaternary volcanism and faulting at O'a caldera, central Ethiopian Rift. Bull Volcanol, 43: 173-190. WoldeGabriel G, 1986. The Awasa caldera in the main Ethiopian Rift (MER). IAVCEI 1986 Cong, New Zeal, Abs, p 351. 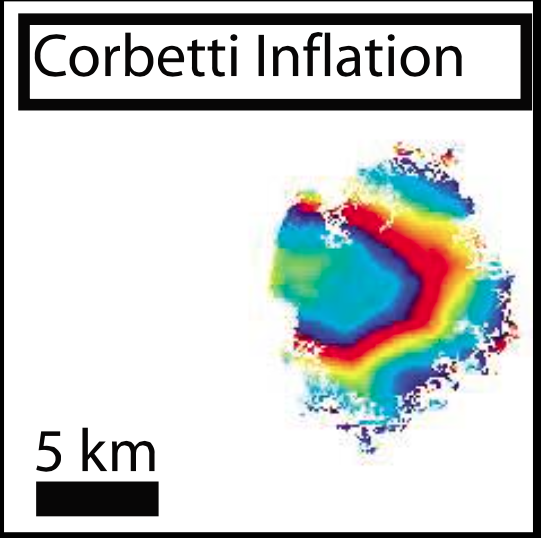 Corbetti inflation. Each fringe represents 2.8 cm of deformation. 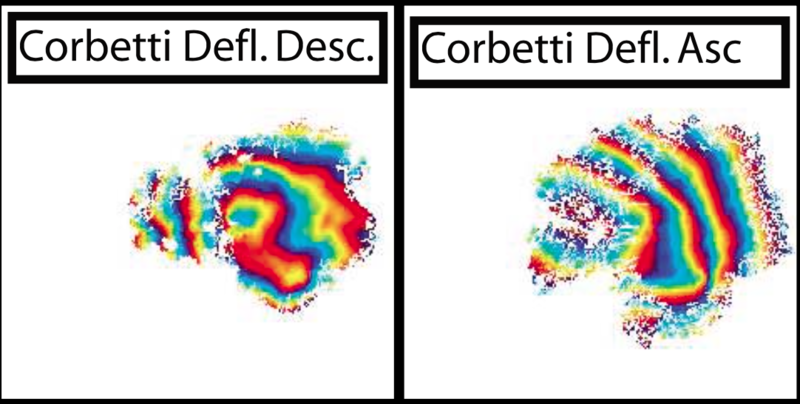 Corbetti deflation (Desc), 23 September 1997 to 13 September 2000; Corbetti deflation (Asc), 28 September 1997 to 17 September 2000. Each fringe represents 2.8 cm of deformation. There is no Emissions History data available for Corbetti Caldera. 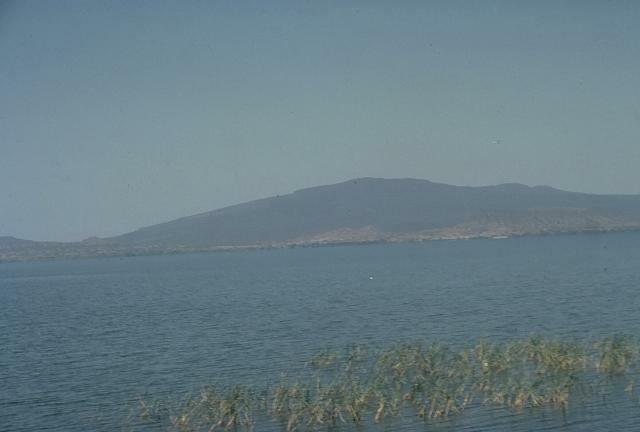 Chabbi volcano, rising to the north across Awasa lake, is a very large obsidian dome constructed on the SE rim of the 15-km-wide Corbetti caldera, which itself lies within the NW side of the larger Awasa caldera. In this photo Corbetti caldera is out of view behind its southern rim, which forms the low saddle at the left. Lava flows from Chabbi extend into Corbetti caldera. The age of the latest eruption of Corbetti volcano is not known, although fumarolic activity continues. There are no samples for Corbetti Caldera in the Smithsonian's NMNH Department of Mineral Sciences Rock and Ore collection. Large Eruptions of Corbetti Caldera Information about large Quaternary eruptions (VEI >= 4) is cataloged in the Large Magnitude Explosive Volcanic Eruptions (LaMEVE) database of the Volcano Global Risk Identification and Analysis Project (VOGRIPA).